Omg I am drooling this sounds heavenly. Wow, what a flavor combination... I like it! I guess bananas are offsetting the rhubarb? Oh my that looks absolutely amazing! Will definitely be giving this a go - I've pinned it for future reference!! 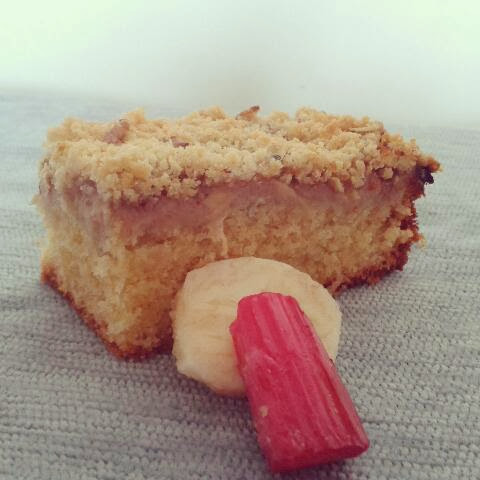 I am not mad on rhubarb, but love banana cake- will be giving it a try with the crumble topping, as love crumble too! Who knows, maybe it will even convince me that rhubarb is ok after all! Hubby loves rhubarb so will have to give this one a go! Pinned to my sweet treats board! I love rhubarb. I love banana. I love crumble. I love cake. This is my idea of food heaven! Oh my goodness!!! I need this cake in my life! It looks and sounds amazing!!! I need to start a Things to do list!! Oh I love the look of this, last year I managed to get some cheap rhubarb and I had no idea what to do with it. I made a compot in the end but this looks even better. Rhubarb and Banana Crumble Cake sounds so delish! Our rhubarb isn't in season for a few months yet, but when it comes in, I am going to make this. Crumble cake is my favourite ever cake! I have never thought about combining banana and rhubarb, but it sounds really yummy! This sounds delicious. Love bananas, love rhubarb.So all good. This sounds delicious! All my fave things - bananas, crumble and rhubarb, yum! looks great and very unusual combination, bet it was delicious! That looks good and I love rhubarb! Love rhubarb, love crumble, love cake, this looks perfect! And warmed up with cream, that'd be seventh heaven..think I need to try this one very soon! Oh wow this sounds GREAT - I've never tried this combination in a cake but I'd love to now. Thanks for joining in with #recipeoftheweek. I've Pinned and Tweeted this post and there's a fresh linky live now. You might have already popped over but if not, please do! I love the idea of a crumble cake. I'd imagine that the topping gives it a lovely crunch. Personally I'd go for it warm with some vanilla Icecream.